Design Two - shown to scale. Challenge: For students to create an original 3D Print design (the students first 3D Print). Background: This has been detailed in a previous post but with the New Zealand School year running from February to December this is the first project of new school year for a new group of students, their first 3D printing projects in the classroom. One student designed the name plate featured on the 29th March print. These two students were inspired by that to produce their own versions for thier first 3D Print. Task: Produce an original 3D print, with design from scratch having some purpose/use. Above: Design One: - name plate. 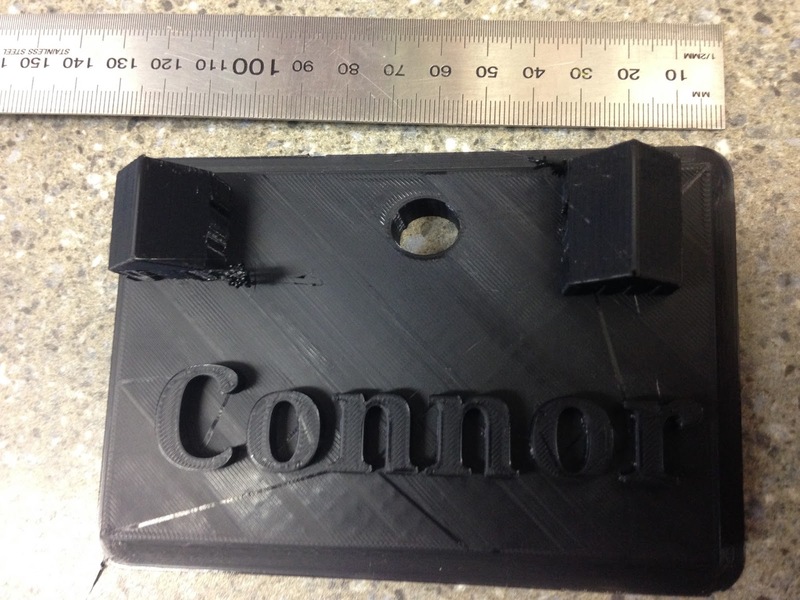 Level of Difficulty: Low - this was the students first project and print and as a result the print was created using some of the default/basic settings on Tinkercad. The students were able to produce something like this within a ten minute time frame. Issues: None - both prints worked from the plan without any issues. 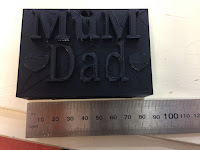 Size: Both prints were similar with their dimensions - 'Mum and Dad' was 80mm by 50mm with a depth of 20mm. 'Connor' had a length of 100mm by 50mm with a depth of 20mm. On reflection both prints could have been a depth of 10mm and this would have had a considerable impact on the print time (see below). Timeframe: Design one 'Connor' eight hours and design two 'Mum and Dad' was a six hour print. Process: The students first original designs, with the idea that this will act as a springboard to more detailed projects. It was an introduction to show the student what would be possible.